This nativity set presents us with a real house of bread reminiscent of the meaning of the word Bethlehem. Christ was born in a House of Bread (Bethlehem) and eventually offered himself as the Bread of Life to those who hunger for justice and peace. Catherine Baillaud is an accomplished bread dough artist and a master of delicate and inspired coloring." 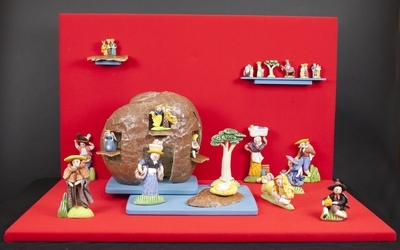 Mini-santons (figures) created from pate de sel (bread dough) and hand painted by Catherine Baillaud in Alsace, France in 1993. The loaf of bread was created separately. The figures depict the nativity of Jesus. Exhibition label originally written by Fr. Johann G. Roten, S.M. for exhibit entitled "At The Manger: No Place Like Home" held at Roesch Library, University of Dayton.